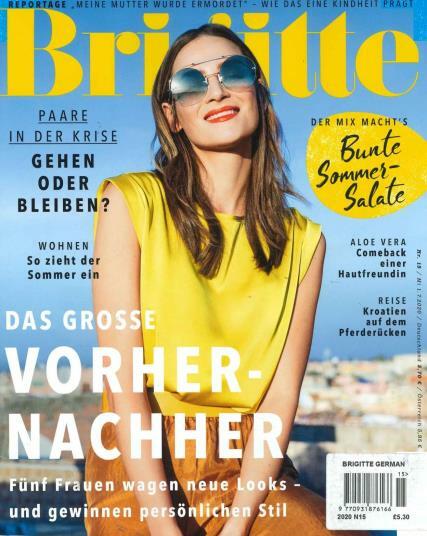 Brigitte is listed as the top women’s magazine in Germany with a readership of approximately 3.6 million and circulation figures of 800,000. Brigitte Huber and Stephan Shafer are the co-editors of the publication. Buy a single copy or subscription to Brigitte magazine. In the pages you will find the kinds of lifestyle information you find in any popular women’s magazine. There are articles on fashion trends accompanied glossy photos of new apparel, recipes, makeup tips, relationship information, news on exercise trends, and reviews of movies, music and books. Recent issues of Brigitte included articles on the fashion image of Michelle Obama, a recipe for black forest cherry cake, glittering party makeup tips, a quiz to find out if you are falling in love too quickly, and a book review on a newly released travel book.